Lee Smith also known as Red-E is a graffiti artist from Wolverhampton U.K. In the 1980’s Heathtown, a housing estate in Wolverhampton became the living and breathing space of graffiti and street art. The estate built up by high rise flats and layers on top of layers of housing, created walls, alley ways and surfaces which would soon become canvases for a new art form to arriving to the UK from the USA: Graffiti. A Young Lee Smith would see his whole surroundings change into a multi-coloured gallery of graffiti. He would soon pick up the spray can and become a contributor to this culture. Like most young people at the time Lee was inspired by the works of local graffiti artist Goldie, and in 1991 after years of illegal street graffiti, Lee now known as Red-E joined creative forces with Goldie and Temper to produce a painting ‘Nike’ which was a part of a project for Wolverhampton Museum and Art Gallery. He once again joined forces with Goldie and Dez on another commission.Red-E and his graffiti would adorn walls across the city for many years. The founding member of The Ruff Stuff Graffiti Crew he spent years creating murals and large scale productions in several locations in the city. Red-E also extended his creative nature by being a specialised barber and at this time was at the forefront of fashion with his artistic and crafted hairstyles in the Hip Hop and general afro Caribbean community. After spending time working as an artist for a clothing printing company, Red-E continued his art as he spent many years in the youth services, where his street knowledge and understanding made many great changes for unprivileged children and young people. He went on to become a senior figure in Wolverhampton Youth Service before continuing full time with his art. More recently Red-E has played a key role in the development of legal public graffiti spaces in the Wolverhampton area. His art has made front page news and attracted media attention because of his striking art work. His work, which was painted onto a race car, for the scum run rally drove through Europe and raised money for the children's hospital in Sussex. Red-E has been commissioned by Wolverhampton Wanderers for a special promotion for the football club and has also done work for the paint giant Dulux. 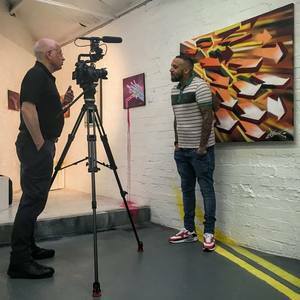 A newly documented Hip Hop heritage committee has included Red-E to represent graffiti and featured his work on a TV feature.